Is It a Drug Allergy or a Side Effect? We noticed that most drug advertisements now say something like “Do not take this drug if you are allergic to it or any of its ingredients.” We wondered when this caveat started. We have repeatedly warned about the side effects of psychiatric drugs, also called adverse reactions. Side effects are the body’s natural response to having a chemical disrupt its normal functioning. One could also say that there are no drug side effects, these adverse reactions are actually the drug’s real effects; some of these effects just happen to be unwanted. So we were curious about how warnings of drug side effects have apparently morphed into warnings about being allergic to drugs. Was this another example of the psycho-pharmaceutical industry redefining terms to downplay the adverse reactions? Well, what is an allergy? Allergies occur when the immune system overreacts to a foreign substance by producing antibodies which identify the substance as harmful. The word itself comes from German allergie, from Greek allos “other” + Greek ergon “work” or “action”. We often think of an allergic reaction as from something environmental, such as inhaling pollen, which causes the immune system to reject the substance. The experts say that the difference between an allergy and a side effect is that an allergy generally results from the immune system rejecting the substance, and a non-allergic side effect is a predictable result from some particular chemical or biological property of the substance not involving the immune system. We get the difference, but we still see the psycho-pharmaceutical industry starting to emphasize allergic reactions over side effects in their public relations campaigns, even though allergic reactions are rare compared to side effects, reported as less than 10% of the cases. The implication seems to be that an allergic reaction is not the drug’s fault, it’s the body’s reaction, whereas a side effect is caused by the drug. We think the distinction is moot, but is being used to downplay drug side effects and transfer the attention and blame off the drugs. One reference says this about it: “A drug allergy occurs when your immune system mistakenly identifies a drug as a harmful substance.” Aha, a deliberate attempt to cast drugs as non-harmful. The literature shows discussions about the difference between allergy and side effect over many years, but it’s only recently that we’ve noticed the emphasis in advertisements on allergy instead of side effect. There are also some genetic effects that confuse the issue. An adverse reaction can also be a reaction to drugs or toxins which cannot be metabolized due to a genetic lack of cytochrome P450 enzymes. We also remind people that the real problem is that psychiatrists fraudulently diagnose life’s problems as an “illness”, and stigmatize unwanted behavior or study problems as “diseases” so that they can prescribe drugs. Psychiatry’s stigmatizing labels, programs and treatments are harmful junk science; their diagnoses of “mental disorders” are a hoax – unscientific, fraudulent and harmful. All psychiatric treatments, not just psychiatric drugs, are dangerous. We do suggest that people review the potential known side effects of any prescribed drugs; this is one of the cardinal precepts of Full Informed Consent. Orilissa (generic elagolix) is a drug from AbbVie Inc. and Neurocrine Biosciences, approved by the FDA in the summer of 2018, and prescribed for women with moderate to severe endometriosis pain. Endometriosis is a chronic disease in which uterine lining tissue grows outside the uterus. The drug shuts down the hormonal cycle, stopping the monthly menstrual period. It is currently being heavily advertised, with a list price of approximately $850 per month. It caught our attention because some of the serious side effects are suicidal thoughts, actions, or behavior, and worsening of mood. The prescribing information advises that patients with new or worsening depression, anxiety or other mood changes should be referred to a mental health professional. We urge caution, because a psychiatrist may misdiagnose such symptoms as a mental disorder rather than a drug side effect, and prescribe harmful psychotropic drugs instead of properly handling the side effects. Suicidal ideation and behavior, including one completed suicide, occurred in subjects treated with Orilissa in the endometriosis clinical trials. Users had a higher incidence of depression and mood changes compared to placebo. Some of the most common adverse reactions in clinical trials included anxiety, depression and mood changes. The drug is a gonadotropin-releasing hormone antagonist, which means it blocks the receptors of certain hormones in the brain’s pituitary gland, leading to the suppression of luteinizing hormone, follicle-stimulating hormone, estradiol, and progesterone. Patients are advised to limit the duration of use because of bone loss; bone mineral density loss is greater with increasing duration of use and may not be completely reversible. The drug is metabolized in the liver by cytochrome P450 enzymes, so a person genetically deficient in these enzymes, or who is taking other drugs that inhibit CYP450 enzymes, is at risk of a toxic accumulation of the drug leading to more severe side effects. There does not appear to be any scientific data about exactly why suicidality and behavior changes are potential adverse reactions, but we might surmise that messing with hormones in the brain is not exactly a well-known precision science. The major issue we see is that mood changes as a side effect from Orilissa are likely to be misdiagnosed. Since psychiatrists do not perform clinical tests and are wont to prescribe an antidepressant rather than get to the root of the problem, we want to be sure every candidate for this drug understands the issue and practices full informed consent to any psychiatric treatment. The U.S. government funded training for substance abuse researchers in entrepreneurship at Yale, so they could learn how to get more funding for their health care startups about substance abuse. Scholarly articles have been published about “The Psychology of Entrepreneurship“. One such study we noticed focused on industrial and organizational psychology (it has its own abbreviation, I/O); many of its key conclusions were to plead for more research in that area. We think that one of the primary goals of this kind of psychobabble is to set the stage for getting more research funds, rather than coming up with anything truly useful. So it seems that psychiatry and psychology have latched onto entrepreneurs as a new category of those needing “help,” a new pool of potential customers. Entrepreneurs have been targeted by the mental health industry both as a new customer pool and a new way to do business. The competition for government funding and grants to address the problems of entrepreneurship is heating up, and the psychobabble is deafening. And, like any entrepreneur, psychiatrists are looking to the future. Since they have never been required to cure anyone, they continually come up with new disorders, new drugs, and new treatments which they can apply to new communities of potential patients. The news is full of these “miracle” treatments — marijuana, cannabidiol, electric shock (yes, they still do this, and it is a big money-maker), MDMA (Ecstasy), trauma-informed therapy, Ketamine, cognitive-behavioral therapy, transcranial magnetic stimulation, assisted suicide (yes, this is considered a “treatment”), deep brain stimulation, involuntary commitment, vagus nerve stimulation, addiction therapy (ignoring the fact that psychiatric drugs are addictive), and one drug after another — each new one designed to combat the adverse side effects of the one before. The news is devoid, however, of one thing — actual cures for mental trauma. Click here for more information about fraud and abuse in the mental health industry. Read about how Full Informed Consent can help. A study published June 12, 2018 from the University of Illinois at Chicago suggests that more than one-third (37.2%) of U.S. adults may be using prescription drugs that have the potential to cause depression or increase the risk of suicide. Information about more than 26,000 adults from 2005 to 2014 was analyzed, along with more than 200 commonly prescribed drugs. However, many of these drugs are also available over the counter, so these results may underestimate the true prevalence of drugs having side effects of depression. Approximately 15% of adults who used three or more of these drugs concurrently experienced symptoms of depression or suicidal thoughts, compared with just 5% for those not using any of these drugs. Roughly 7.6% of adults using just one of these drugs reported a side effect of depression or suicidal thoughts during the study period, and 9% for those using two of these drugs. These results were the same whether the drugs were psychotropic or not. Depression was determined by asking nine questions related to the symptoms defined in the Diagnostic and Statistical Manual of Mental Disorders (DSM-5). “Commonly used depression screening instruments, however, do not incorporate evaluations of prescribed medications that have depression as a potential adverse effect.” In other words, so-called depression screening tests can register false positives when the person is taking one or more of roughly 200 prescription drugs. We thought we should dig a little deeper into this phenomenon. First, understand that there is no depression “disease”. A person can certainly have symptoms of feeling depressed, but this is not a medical condition in itself. An example of a medical condition with a symptom of depression would be a vitamin B1 (thiamine) deficiency. You don’t fix it with an antidepressant; you fix it with vitamin B1. There are hundreds of medical conditions that may have mental symptoms, just as there are hundreds of drugs that can cause or worsen these symptoms. Finding the actual causes with appropriate clinical tests and then fixing what is found is the correct way to proceed. This leads to a topic known as CYP450, which stands for Cytochrome P450 enzymes. Cytochrome means “cellular pigment” and is a protein found in blood cells. Scientists understand these enzymes to be responsible for metabolizing almost half of all drugs currently on the market, including psychiatric drugs. These are the major enzymes involved in drug metabolism, which is the breakdown of drugs in the liver or other organs so that they can be eliminated from the body once they have performed their function. If these drugs are not metabolized and eliminated once they have done their work, they build up and become concentrated in the body, and then act as toxins. The possibility of harmful side effects, or adverse reactions, increases as the toxic concentration increases. 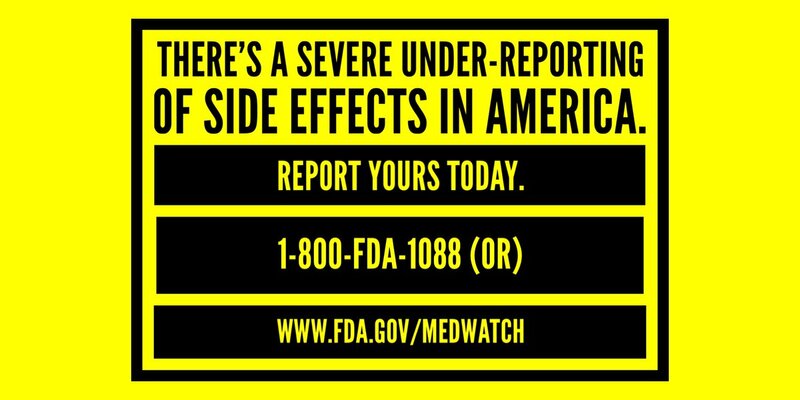 The ballpark estimate is that each year 2.2 million Americans are hospitalized for adverse reactions and over 100,000 die from them. Some people are deficient in CYP450 or have diminished capacity to metabolize these drugs, which may be a genetic or other issue. Individuals with no or poorly performing CYP450 enzymes are much more likely to suffer the side effects of prescription drugs, particularly psychiatric drugs known to have side effects of depression, violence and suicide. These metabolic processes are immature at birth and up to three years old, and this may result in an increased risk for drug toxicity in infants and young children. Furthermore, certain drugs or certain excipients in vaccines may inhibit activation of CYP450 enzymes, again resulting in an increased risk for the accumulation of non-metabolized drugs and the resultant increase in adverse side effects such as depression, violence and suicide. The side effects caused by a CYP450 deficiency and its subsequent failure to metabolize any one of hundreds of drugs can then be misdiagnosed as a mental illness, the patient then being prescribed more psychiatric drugs in a mistaken attempt to treat those side effects, further complicating the problems. It is estimated that 10% of Caucasians and 7% of African Americans are Cytochrome P450 deficient. The psychiatric and pharmaceutical industries have been aware of this phenomenon for some time, yet they have continued to push psychiatric drugs at an ever increasing rate, and the dramatic increase in symptoms of depression, suicide, and school violence is a direct result. No one should be prescribed these types of drugs without adequate testing for a CYP450 deficiency, in order to determine their risk potential for adverse reactions. The test is not “standard of care” so one has to ask for it; but beware, they will still recommend an alternative drug if the original one cannot be easily metabolized. Better yet, stop prescribing all psychiatric drugs and find out with proper medical, clinical tests what the real problems are and treat those. Full informed consent is always indicated. Any psychiatrist or pharmaceutical company that has knowingly withheld evidence about the relationship between CYP450 enzymes and drug side effects should be subject to both prosecution and litigation. Medical students should be educated about these relationships. For more information click on any of the links in this newsletter. Cannabidiol (CBD) – Can We Be Sure It’s Safe? Every time we say “CBD” out loud we think Bidi Bidi and picture Buck Rogers’ Twiki the Robot. But really, what is CBD, and is it harmful or helpful? Derived from Cannabis (marijuana), CBD is one of many cannabinoids which are chemical compounds capable of binding to specific biological receptors in the brain or other sites in the body. The theory is that when CBD binds to these brain receptors it seems to suppress or limit the immune system’s inflammatory signals. CBD and THC are structural isomers, which means they share the same chemical composition but their atomic arrangements differ. The claim is that CBD, unlike THC, is not hallucinogenic. Much of the research information so far available about CBD comes from animal studies. Although it is a cannabinoid, CBD apparently does not directly interact with the principal receptors in the brain to which THC binds, and binds to many other non-cannabinoid receptors in the brain. Basically, the research to date is unclear on exactly how CBD works, except that we know it affects the brain. We’d call these observations mostly anecdotal — that is, people have reported on their observations and feelings, but the double-blind human clinical trials are sparse. Animal studies have demonstrated that CBD directly activates multiple serotonin receptors in the brain, and we know that in humans at least, psychiatric drugs which mess with serotonin levels in the brain are addictive and have some disastrous side effects. The manufacturers of every psychiatric drug so far which messes with serotonin in the brain say they don’t really know how it works. CBD, LSD, mescaline, and other hallucinogenic drugs bind to the same serotonin receptors in the brain, so calling CBD totally non-intoxicating is a bit of a stretch. We think the insistence on calling CBD “non-intoxicating” or “non-hallucinogenic” is Public Relations for “Bidi bidi, gee, we can make a bundle with this.” While the anecdotal evidence claims no hallucinogenic effect for CBD, the fact that it affects serotonin in the brain makes it less attractive as a healthy alternative. Its long-term effects are simply unknown. Some proponents promote taking THC and CBD together. We think this is a short path to becoming a bidi bidi robot. At higher dosages, CBD will deactivate cytochrome P450 enzymes, making it harder to metabolize certain drugs and toxins, particularly psychiatric drugs. What about CBD oil or cream (hemp extract) applied to the skin? Is there a difference between CBD derived from hemp and CBD derived from marijuana? CBD is legally available in the United States, but it must be derived from imported high-CBD, low-THC hemp. CBD itself is not listed under the Controlled Substances Act, so it’s legal in all 50 states provided it’s not extracted from marijuana. A huge amount of fiber hemp is required to extract a small amount of CBD, so researchers are focused on breeding plants with more CBD and less THC just for this purpose. It is important to note that all cannabidiol products are not approved by the FDA for the diagnosis, cure, mitigation, treatment, or prevention of any disease. CBD and THC both interact with the body through a vital nerve signaling system which regulates a wide array of functions, some of which include: pain, appetite, mood, memory, immune response, and sleep. There are still very little long-term safety data available. The proponents of CBD, whether for internal or external use, ignore the fact that it messes with serotonin when making claims for its safety and usefulness, so caution is advised. There is a lot of money riding on making these substances legal and ubiquitous; any bad effects are not going to be advertised or promoted. At present, we’d prefer not to experiment with substances that tweak the brain in ways that are not fully understood, lest we become like bidi bidi Twiki. As always, your fully informed consent for any treatment is of paramount importance. The New York Times had an article April 7, 2018 discussing the fact that antidepressants are actually addictive and have withdrawal symptoms. Quotes are from this article. On the other hand, CCHR has been making this known since 1969. 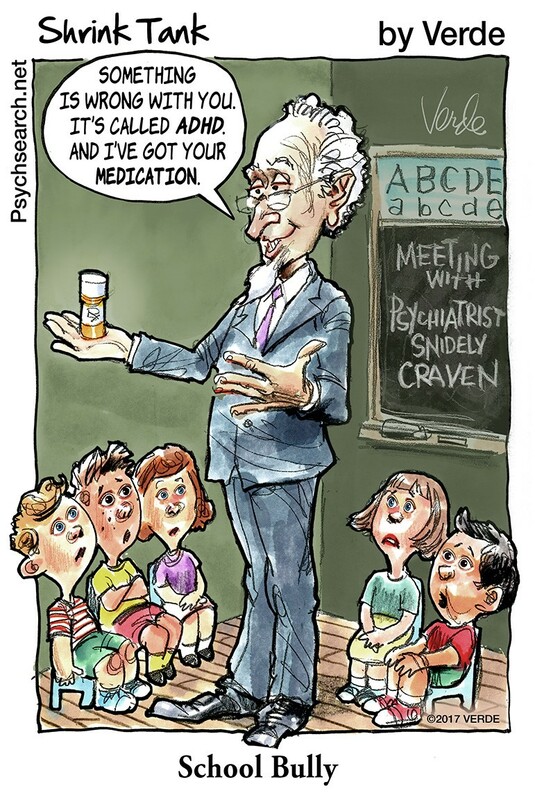 Psychiatrists have been loathe to admit the addictive nature of antidepressants and other psychotropic (mind-altering) drugs, and euphemistically call the side effects of withdrawing from psychiatric drugs “discontinuation syndrome”. Nearly 25 million adults have been on antidepressants for at least two years, a 60 percent increase since 2010. We recommend Informed Consent. Protect yourself, your family and friends, with full informed consent. 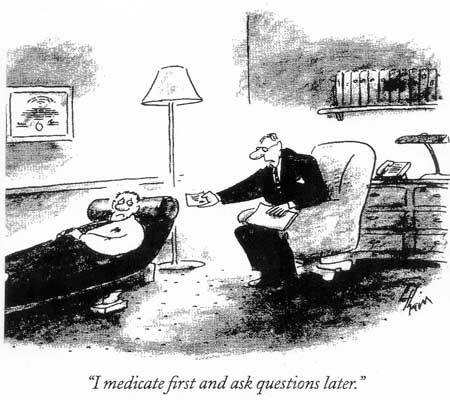 Courts have determined that informed consent for people who receive prescriptions for psychotropic (mood-altering) drugs must include the doctor providing information about possible side effects and benefits, ways to treat side effects, and risks of other conditions, as well as information about alternative treatments. Polypharmacy is another significant problem, wherein a patient is prescribed many, possibly negatively-interacting drugs, often by multiple doctors who might be unaware of each other’s prescription orders. Often, these are drugs that the patient has been taking for a long period; they may be affecting the patient’s health negatively or are simply no longer beneficial. This is often addressed by deprescribing, which is the process of reducing the medication burden of a patient who might no longer need one or more of their prescriptions. Deprescribing principles are intended to improve health care for the patient by minimizing the harm and costs associated with polypharmacy, and minimizing the withdrawal effects of stopping one or more drugs. Medications that may be considered for discontinuation include drugs that are no longer indicated, drugs that pose a risk for untoward side effects, drugs that interact adversely, drugs that are given to mitigate the side effects of another drug, and addictive drugs that have withdrawal side effects. However, addictive drugs should never be discontinued abruptly, since the withdrawal side effects can be severe. For more information about how to safely withdraw from these harmful and addictive psychiatric drugs, download and read the booklet Coming Off Psych Drugs Harm Reduction Guide. We saw a TV commercial recently for the drug Otezla® (generic apremilast), from Celgene Corporation, which was approved by the FDA in 2014 for the treatment of symptoms of moderate to severe plaque psoriasis (skin lesions) and psoriatic arthritis. Our attention was caught by the statement that Otezla is associated with an increase in adverse reactions of depression, suicidal thoughts, or suicidal behavior. We wondered why, since this drug is not used for psychiatric diagnoses, and psychiatric drugs all have such potential side effects. The drug inhibits the enzyme phosphodiesterase 4 (PDE4), but the exact way in which it is supposed to work “isn’t completely understood”. The estimated wholesale price is $22,500 for a year of treatment. Digging deeper, we find that apremilast is an analog of thalidomide which was primarily prescribed as a psychotropic sedative or hypnotic and which was banned in 1961 for causing disastrous birth defects. Depression is also a common side effect of thalidomide. In 1998 thalidomide was approved again by the FDA for use in multiple myeloma, a type of cancer, because it apparently had some kind of anti-inflammatory effect. It still is not known how it is supposed to work. Analogs of thalidomide were then developed to try to limit the side effects; an analog is a compound having a chemical structure similar to that of another one, but differing from it in respect of a certain component. Analogs are developed to see if they can improve upon the function of the base drug. Well, apparently this one side effect — depression — did not get eliminated in the transformation from thalidomide to apremilast. If someone has been given the full range of pros and cons for a drug or other treatment (i.e. full informed consent), with all applicable alternatives and even the alternative of no treatment, and then decides to take the drug or treatment, they made a fully informed decision. But we know that such informed consent is rarely, if ever, obtained prior to a psychiatrist or other doctor writing a prescription for a psychotropic drug. Click here to learn more about informed consent.